During the U.S. naval blockade of Cuba during the Cuban Missile Crisis, who was the Secretary of the Navy? A SigEp Patriot, that’s who! In addition to that Brother, the SigEp Patriots Project (SPP) honors and remembers 19 SigEp Patriots from nearly as many chapters, including one brother who made the ultimate sacrifice during World War II. In addition to the significant days in our history during this week, it is very important to remember that September is Suicide Awareness Month. Considering making a donation to ActiveHeroes.org where two-time Operation Iraqi Freedom Veteran and Michigan Eta Brother Captain Justin Fitch, U.S. Army is highlighted speaking to the fact that 22 veterans a day commit suicide. Please note the upcoming memorial for the North Carolina Beta brother who recently passed away. Bernard Kumo entered the U.S. Navy on this date. We found his name in an edition of The Journal, however the national headquarters has “Kumko” as his last name. Bernard became a brother at Virginia Eta at the conclusion of his military service, and his return to the University of Virginia where he graduated with the Class of ‘44. World War II Veteran and Kansas Gamma Brother Second Lieutenant Raymond L. Childers, U.S. Army was released from the military on this date after about 15 months of service. 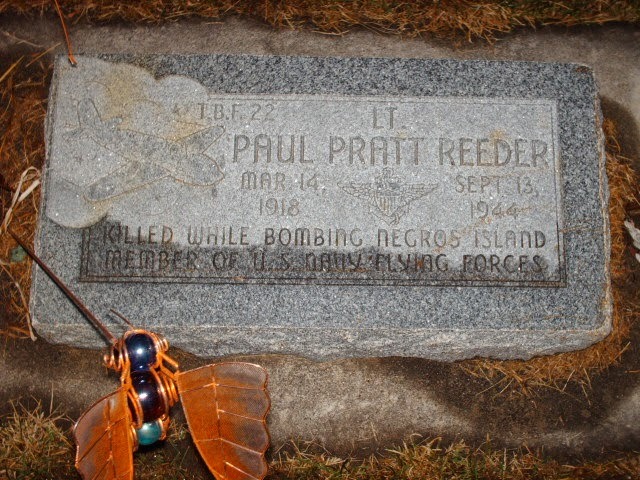 World War II Veteran and UT Alpha Brother Lieutenant Paul Pratt Reeder, U.S. Navy made the ultimate sacrifice on this date. Brother Reeder was a pilot with VT-22 off of the USS Cowpens (CVL-25) when he was killed in action when his TBM-1C (Avenger) crashed during the bombing of Negros Island, The Philippines. He entered the Naval Air Corps in OCT 1941, and was commissioned JUL 1942 in Corpus Christi, TX. Before he was killed Paul had participated in four major battles against the Japanese. Brother Reeder was laid to rest with military honors at Smithfield City Cemetery in Smithfield, UT, and respect can be paid to him there at Plot C-41-10. World War II Veteran of the European Theater and Iowa Beta Brother Corporal Maynard W. Pechman, U.S. Army was discharged from the Army after nearly three years. World War II Veteran and Iowa Alpha Brigadier General Morris J. Lee, U.S. Air Force (Retired) died on this date. A native of Woodbine, IA, Morris was a member of the Class of ’29, but only attended Iowa Wesleynn College in 1926 before transferring to the Military Academy at West Point where he graduated in 1930. Assigned to the Cavalry, Brother Lee transferred to the Air Corps in 1931, and was a rated pilot before year end. Over the next ten years, Morris qualified as a test pilot, pilot, senior pilot, aircraft observer, glider pilot, and senior glider pilot. Duty with the Operations Division of the U.S. Army General Staff (then part of the) War Department, from 1942 to October 1944, was followed by a tour of foreign service which earned Morris battle stars for participation in the campaigns in the Western Pacific, Air Offensive Japan and Eastern Mandates, and he completed more than 150 combat hours commanding a B-29 bomber group. Upon his return from overseas in late 1945, Brother Lee was assigned as chief of staff, Atlantic Division, Air Transport Command, and served as the chief of staff of West Point from 1947 to 1949. 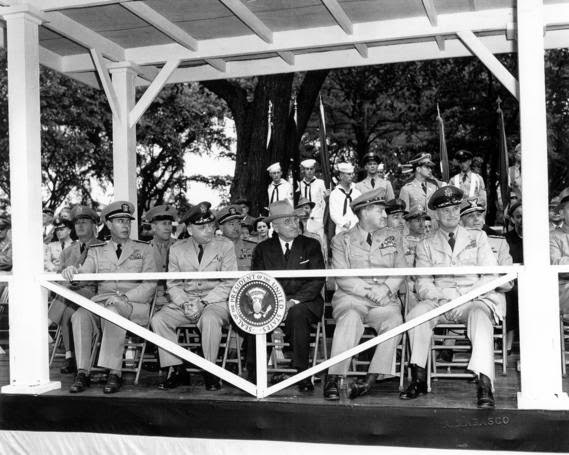 Following a brief assignment with the Joint Chiefs of Staff, Morris’ appointment as commanding officer of Headquarters Command, U.S. Air Force in OCT 1950, led to his promotion to brigadier general later that year. He retired from the Air Force in 1956 after more than 25 years of service. According to the SPP archives, Morris is the first SigEp Patriot to be awarded the Air Force Defense Service Medal, and is one of only three to ever be presented with this medal. His other awards include the Legion of Merit, Distinguished Flying Cross, Soldiers Medal, and Air Medal. Respect can be paid to Brother Lee at Arlington National Cemetery in Arlington, VA.
On this date, U.S. Army Air Corps World War II Veteran, Secretary of the Navy, Assistant Secretary of the Army, SigEp Citation Recipient and Texas Alpha Brother Frederick H. Korth, 89, died at his home in El Paso, Texas. After graduating from the University of Texas and receiving a law degree from George Washington University, he returned to Fort Worth to practice law, and joined the Air Transport Command with the outbreak of WWII. After the war, Fred became president of Continental National Bank, a post he left for two years to serve as an assistant secretary of the Army in the Truman Administration. 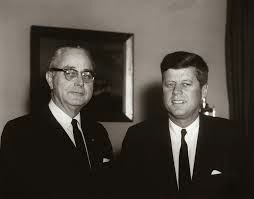 In 1962, President Kennedy appointed Brother Korth the 57th Secretary of the Navy. It was here that Fred was a part of history. During those 13 dark days in October 1962, the U.S. Navy stood their ground staring down Soviet ships carrying nuclear weapons to Cuba. Fred also fought to upgrade our Navy's ships. He saw that nuclear powered ships were the future and that they would be the most effective way to transport our troops and defend our borders. While not successful in making this change at first, time proved him right. After serving as Secretary of the Navy, Brother Korth spent the next 36 years practicing law with his son in Washington, DC. In 1965, Fred was presented the SigEp Citation. Brother Korth was laid to rest under a three century old Texas Live Oak on his ranch in El Paso. 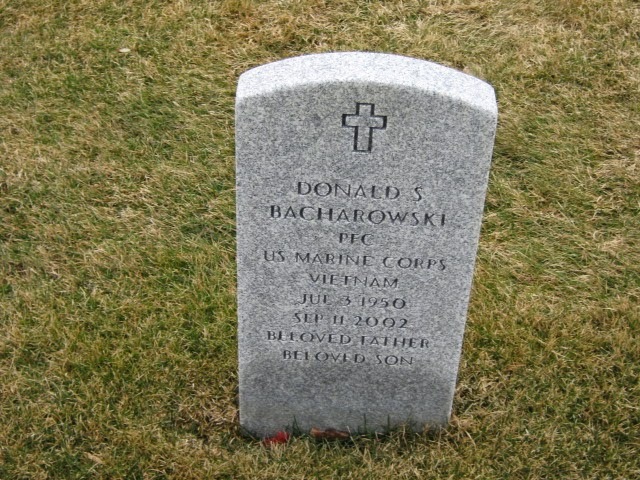 Vietnam War Veteran and Ohio Nu Brother Private First Class Donald S. Bacharowski, U.S. Marine Corps, died on this date. He was just 52 years old. A member of the Class of ’85 at Cleveland State University, Donald became a brother of Sigma Phi Epsilon in 1980. Brother Bacharowski was laid to rest with military honors at Ohio Western Reserve National Cemetery in Rittman, OH, and respect can be paid to him there at Section 16, Plot 217. U.S. Veteran and New York Beta Brother Robert S. Spangler died on this date. A graduate of the Class of ’52 at Cornell, Robert was a retired salesman and marketer in the industrial plastics field. If you or anyone you know has information about Brother Spangler or any other SigEp Patriot we would love to hear from you. On this date, Vietnam War Veteran and Idaho Alpha Brother First Lieutenant James W. Swan, U.S. Army, 66, died in his cabin in McCall, Idaho with his family by his side. James joined Army after graduating from Idaho State University with a degree in Business Administration and Marketing. He returned to Boise to work for his father at the Jess W. Swan Insurance Agency. Jim and a partner purchased the Jess W. Swan agency in 1977, and they enjoyed a great and successful partnership and business for many years. Jim served in several capacities including president of the Idaho Independent Insurance Agents Association, and was also a former Independent Insurance Agent of the Year. Brother Swan was laid to rest with military honors at the Idaho State Veterans Cemetery in Boise, and respect can be paid to him there at Section 10, Row P, Site 128. U.S. Navy World War II Veteran of the Navy Medical Services Corps, North Carolina Epsilon Brother Samuel A. Burgess, Jr. died on this date in Raleigh, North Carolina. A native of Jacksonville, FL, upon graduating from high school, Sam immediately entered Davidson College, where he studied until he was old enough to volunteer for the Navy Medical Corps during WW II. Upon completing his military service at the Portsmouth Naval Hospital in Virginia, he returned to Davidson College and graduated in 1948. After attending the School of Business at Columbia University in New York City, Sam was employed in the cashier’s office of the Equitable Life Assurance Society in Harrisburg, PA for a year before entering Union Theological Seminary in Richmond, VA to study for the Presbyterian ministry. Upon graduation in 1952, he was ordained in Sparta, NC by the Presbytery of Winston-Salem and called to the Elkin Presbyterian Church in Elkin, NC. Sam then went to Scotland to engage in Form Critical New Testament Studies at the University of St. Andrews. Upon returning home at the completion of his studies, Brother Burgess became the organizing pastor of a new Presbyterian church in Garner, NC in 1956. During his pastorate, Sam served as a Commissioner to the General Assembly of the Presbyterian Church in 1960, 1976, and 1984. Love of community and people led him to serve in various offices and organizations including Boards of Directors of the American Cancer Society and the Triangle Counseling Center, president of the local PTA, and Chaplain for many years at the Garner Civitan Club. Upon retirement in 1990, Sam volunteered his time tutoring students in the field of reading at Vandora Springs Elementary School and providing support to patients as a volunteer at Rex Hospital. Respect can be shown to Brother Burgess at Williamsburg Cemetery, Kingstree, SC. U.S. Marine Corps Veteran and New Hampshire Alpha Brother Edward “Ted” R. Haskell, 84, died on this date at Southern Maine Medical Center in Portland, Maine with his family by his side. Following high school, Ted was accepted at Dartmouth College and then deferred, enlisting in the U.S. Marine Corps in 1947. After proudly serving in the Marine Corps, Ted returned to Dartmouth where he played on the hockey team, and received a business management degree as a member of the Class of 1952. Brother Haskell worked with his dad to create the Robert Haskell Company, an office products organization, originating in Beverly, MA in 1953. Following the early passing of his father and the advent of computer technology, the company evolved into Systems Automation, Inc (SAI), and Ted worked to take SAI from one of the prominent Boston area office automation and computer networking companies to one of the nation’s top office automation dealerships. Ted was a member of the Salem Five Cent Savings Bank Board of Trustees for over 20 years, and the Salem Massachusetts Rotary Club Dartmouth College. Respect can be paid to Brother Haskell at Swampscot Cemetery in Swampscot, MA. World War II Veteran and Iowa Beta Brother First Lieutenant Whitney “Whit” McCormack, U.S. Army Air Corps died on this date at the age of 89. Whit became a SigEp in MAY 1941, and joined the Army the next year. From 1942-95 he flew C-54 cargo aircraft. After the war, Brother McCormack returned to Iowa State University where he graduated with a degree in Aeronautical Engineering. Whit was a member of the Sons of the American Revolution, and he worked for Chance Vought or its successors, Northrop, and Lockheed Martin. Brother Lee was laid to rest with military honors at Dallas-Fort Worth Cemetery in Dallas, TX, and respect can be paid to him there at Section 106, Site 970. U.S. World War II Veteran and Alabama Alpha Brother Robert J. Bedwell passed away on this date in Piedmont, Alabama. Bob graduated from high school in 1944, and served in the U.S. military during WW II before attending Auburn University at the completion of his military service. Brother Bedwell joined New York Life in September 1962, and retired in July 1999. During his career with New York Life, Robert was No. 1 in the entire company for 10 consecutive years in sales of Employee Protection Group Plans. Very active in the community, Robert was the recipient of the Golden Eagles of Auburn University award, and founder and past president of the Central Alabama Alumni Association of Sigma Phi Epsilon. He was also the organizer and past president of the Capital Club of Montgomery, and a member of the Montgomery Lions Club for over 60 years. **SigEp Patriots continue to enjoy affairs of the heart. SigEp Patriot and Virginia Pi Brother Erik Burg, and Operations Restore Hope & Iraqi Freedom Veteran, Texas Alpha Brother Commander Jeff Hensley, U.S. Navy (Retired) both got engaged last week! **Operation Enduring Freedom Veteran and Missouri Mu Brother David Freedline learned last week that he has been selected for promotion to Lieutenant Commander, U.S. Navy Reserve. Congratulations to all our Brothers! Have great news of a promotion, new orders, the birth of a child or anything else? SPP would love to share it with everyone! Just send an email to sigepswhoserve@gmail.com. *On 06 SEP, U.S. Army Veteran and Iowa Delta Brother Earl "Dean" Swartzwelter, 79, passed away in Naples, Florida after a valiant 12 year struggle with cancer. *U.S. Marine Corps Reserve Veteran and South Carolina Alpha Brother J. Warren Hilton, Jr., 73, passed away 07 SEP in Charleston, South Carolina. *On 10 SEP, U.S. Army Veteran and North Carolina Beta Brother Charles L. Justus, 80, passed away in Cuyahoga Falls, Ohio. A memorial service will be held at 1 pm, Saturday, September 20th at the Clifford-Shoemaker Funeral Home, 1930 Front St., Cuyahoga Falls, OH, 44221. Our thoughts and prayers go out to the family, friends and chapter brothers of SigEp Patriots Swartzwelter, Hilton and Justus. While they are no longer with us, the greatest casualty is being forgotten, and the SigEp Patriots Project (SPP) pledges these Brothers will always be remembered.